In 2017 the Royal New Zealand Air Force commemorated its 80th anniversary in style, holding a large ‘Air Tattoo’ at Ohakea Airbase, on February 25-26. Report by Chris Gee, all photos by author. The RNZAF became an independent service in 1937, and this airshow formed the highlight of its celebrations to mark the occasion. The last time the Air Force held an airshow was five years ago, for its 75th anniversary, and is remembered for its intense traffic troubles. This year however things went very smoothly, with a distributed ‘Park n Ride’ system used, and all tickets available online only. The weather was superb, the flying was excellent, and the attendance was good, with just over thirty thousand people attending over the two public days. International participation was high this year, with assets coming from New Zealand’s defense partners. The real drawcard for the airshow was without a doubt the foreign contributors, especially the fast jets. Two Australian F/A-18s, two American F-16CJs and two F-15SGs from Singapore provided a sight not seen at Ohakea since the 1980s. 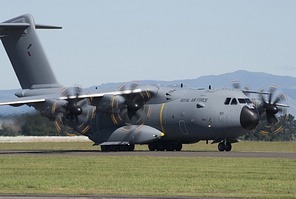 Tactical and strategic airlift was of particular interest this year, with the participation of the A400M, C-17 and C-130J aircraft being prescient, as the government ramps up towards choosing a type (or types) to replace the RNZAF C-130 Hercules fleet. Every type in the RNZAF’s inventory was in attendance, along with heritage aircraft that saw RNZAF service. The usual fleet of classic and warbird aircraft for which New Zealand airshows are so famous were not in attendance, this being a public RNZAF-focused and not private venture. The hosts of this birthday bash really put the effort in to show themselves off at the Air Tattoo 2017. For the first time they pulled together a ‘mass take off’ with all current types in service lining up. The A109LUH, SH-2G(I), NH90, B-200, T-6, B757, P3K2 and C-130H all formed one flight, known as ‘Airforce’. The call ‘Airforce – cleared for take off!” is probably a unique one. The Air Force band played in front of these aircraft, along with a convincing haka performed by RNZAF personnel. The RNZAF’s heavy metal came together in the form of ‘Formation Thunder’, comprising the Boeing 757-200, flown by FltLt Ben Woodhouse and crew, two C-130H(NZ) Hercules flown by WgCdr Andy Scott’s and FltLt Alex Tredrea’s crews, and the P-3K2 Orion flown by Sqn Ldr Rod Oliff and his crew. 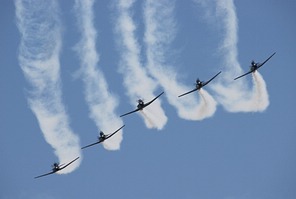 They performed very tight formation flying together, along with an impressive ‘break’ towards the crowd. Each aircraft performed their own displays, with the No.40 Sqn B757’s world famous max-rate climb and wingover being a highlight. The P-3K2 from No.5 Sqn performed a scenario display, dropping rescue supplies. The two C-130Hs from No.40 Sqn carried out both solo and scenario displays, showing off their versatility as they performed precision airdrops of CDS (Containerized Delivery System) pallets onto the airfield, as well as tactical landings of an LOV (Light Operational Vehicle) and troops, plus a para-drop of two of the KiwiBlue Parachute Display team, W/O Lev Leatherland and W/O Kevin Pope, from PTSU. The airshows finale was provided by a spectacular release of flares from one of the C-130s. With some of the airframes being up to 52 years old, all three of these aircraft types are due for retirement starting from 2020, so there are some very big decisions coming up as to which platforms to replace them with. The government has sent out RFI’s (Request for Information) to industry for it Future Air Mobility Capability (FAMC) requirement, and there are multiple aircraft in the running, such as the Airbus A400M, Embraer KC390, Kawasaki C-2, Lockheed C-130J, Leonardo C-27J and Airbus C295, as well as the C-17 as a long shot. Also RFI’s have also gone out for New Zealand’s Future Air Surveillance Capability (FASC) requirement, and in the running are the Boeing P-8 Poseidon, Kawasaki P1, Saab Aerospace Swordfish (Bombardier G6000 and/or Q400), Leonardo ATR-72MP and Airbus C295MPA Persuader. The RNZAF’s fixed-wing training assets came together to form ‘Formation Lightning’ and was comprised of one newly leased Beechcraft King Air B-200 of No. 42 Sqn and two Beechcraft T-6 Texan II Advanced Trainers from No.14 Sqn, which are also leased. Twice an attempt was made to get both Formation Thunder, Formation Lightening and a formation of the three helicopter types overhead the airshow at the same for a unique photo opportunity, but it never quite came off, although there are plenty of photos of the Lightning and Thunder formations together. The new RNZAF Aerobatic Display Team ‘The Black Falcons’ had their debut at the 2017 Air Tattoo, since their previously planned debut at the Wings over Wairarapa Airshow in Masterton the weekend before was unfortunately cancelled due to atrocious weather. The team has big shoes to fill, since their predecessors ‘The Red Checkers’ had become something of a New Zealand Aviation institution, yet their display did not disappoint. The five pilots of the Black Falcons, Sqn Ldr Brett Clayton, Sqn Ldr Hayden Sheard, Sqn Ldr Sean Perrett, FltLt Dan Pezaro and FltLt Stu Anderson, performed an amazing display in their new aircraft. They formed up with four more aircraft to perform a ‘diamond nine’ formation, and then together showcased their well-rehearsed tight formation flying skills. After Ohakea the team took its routine around the South Island of New Zealand as part of their RNZAF’s ongoing 80th Anniversary celebrations. Sqn Ldr Tony Budd also flew a solo routine to show off the new Texan II. Three of the RNZAF’s NH90 Medium Utility Helicopters from No.3 Sqn took part in very active flying displays, displaying their capability to airlift 105mm Light Guns, fast-rope soldiers and deploy troops and payloads in various scenarios. Collectively known as ‘Warrior Flight’, they were led by FltLt James Mackenzie. While initially controversial the NH90s have proven themselves since their introduction. Interestingly two examples were in the static display, one in ‘role’ configuration with machineguns and external fuel tanks fitted, while the other was folded for maritime deployment and attached to its MANTIS remote control towing unit. The NH90 will soon be fully deployable from the RNZN’s HMNZS Canterbury, as well as the new upcoming 24000t HMNZS Aotearoa, the combination of which will be huge boom for the NZDF’s HADR capabilities. The Royal New Zealand Navy’s new Kamen SH-2G(I) helicopter performed a solo flying and ‘role’ display, winching a sailor from a simulated stricken vessel. These new helicopters from No.6 Squadron are maintained by the RNZAF, but flown and operated by RNZN Pilots. These ex-Royal Australian Navy Helicopters are an excellent example of the NZDF making the best out of limited funding. The Australian attempt to introduce these helicopters into service became a complete debacle, with requirements for a 4-axis ‘hands-off’ tactical autopilot in an attempt to operate with just two crewmembers, among other additions, leading to cancellation of the project at huge cost to the Australian taxpayer. However, the RNZN has no requirement for these niceties, and the purchase of 8 of these helicopters, along with two airframes for spare parts, allows an impressive capability increase over our previous SH-2Gs, with the SH-2G(I)’s modern avionics and the new Penguin Anti-Ship missiles, and enough airframes to deploy three helicopters simultaneously on the RNZN’s Frigates and OPV’s for the cost of what would normally buy just a few airframes. The A109 Light Utility Helicopter from No.3 Sqn, flown by FltLt Chris Hall and crew, performed its own display, and also operated as a camera ship for the RNZAF. This versatile little helicopter performs a multitude of roles for the NZ Government, from initial rotary wing pilot training for the RNZAF to Tactical Transport, Law Enforcement Support, VIP transport and Special Operations support. Despite the lack of attendance of many of New Zealand’s warbird regulars there were some fine displays by aircraft from the RNZAF’s past. The RNZAF’s own Historic Flight’s Harvard, flown by FltLt Stu Anderson, performed an excellent display. It would just not be a proper kiwi airshow without a Harvard display! The wonderful arrangement between the NZDF and Brendon Deere’s ‘Biggin Hill’ Historic Aircraft Centre based at Ohakea Airbase, saw their Spitfire Mk IX, and TBM-3E Avenger, both flown by the thoroughly overachieving Sqn Ldr Sean Perrett, display at the airshow, along with their Harvard flown by Dave Brown. Mitty Brereton and Bill Lamb flew the beautifully restored deHavilland DH-104 Devon in a perfect formation with two Harvards. It was a shame the Venom did not fly, but it was added to the heritage static displays where it was joined by an ex-RNZAF Aermacchi MB-339 and a newly restored Harvard. This was the first time since the TRIAD84 Exercise in October 1984 that USAF fast jets have been seen in New Zealand, with the U.S. Government’s long overdue acceptance of New Zealand’s nuclear free policy now meaning we can now enjoy visits by assets declared to be non-nuclear armed, as shown by the recent visit of a US Navy warship for the RNZN’s 75th Anniversary celebrations. Based at Misawa Air Base in Japan, the Pacific Air Force’s F-16 Demonstration Team arrived with two F-16CJ Block 52s and a KC-135 as tanker support. Major Richard ‘Punch’ Smeeding flew exhilarating solo displays that really served to show off the potency of the F-16. The well-practiced routine came with an entertaining commentary that was ‘hammed-up’ in true American style. The C-17A Globemaster III is a common visitor to New Zealand, especially in Christchurch where they operate out of to Antarctica. Flown by Captain Edward Sutton and his crew, the aircraft was literally thrown around the sky as it displayed its exceptional maneuverability. Despite being capable of lifting 70t of payload over great distances the C-17 has excellent STOL characteristics, which it displayed by stopping in a ridiculously short distance, then reversing back up the runway, to show just how small an area this huge aircraft needs to operate. The KC-135 air-to-air refuelling tanker spent the first day of the show parked up in the Static display, where at one point it formed the backdrop for a performance from the Air Force band. Our friends from ‘across the ditch’ brought two F/A-18A ‘legacy’ Hornets. These remarkable aircraft, flown by FltLt Matt ‘Trails’ Trayling and WGCDR Scott Woodland, flew thunderous solo displays, as well as taking part in the ‘scenario’ finale of the airshow. Their vapor-heavy high maneuverability displays are always a great sight. 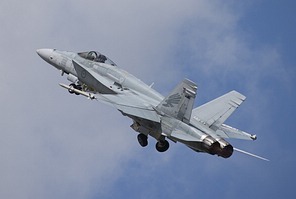 Soon these ‘legacy’ Hornets will be phased out as they are replaced by the new F-35A Joint Strike Fighter, which will be operated alongside their F/A-18F Super Hornets and EA-18G Growler electronic attack aircraft. It may well be some years before we see those types in New Zealand, maybe in another five years for the RNZAF 85th anniversary! The RAAF’s C-17 Globemaster III was very popular in the static displays, with thousands of people pouring through it. Its cavernous interior is truly jaw dropping to behold. It was interesting to notice the RAAF C-17 sporting very advanced DIRCM (Direct Infra-red Counter-Measures) turrets, used to directly disable incoming missiles. New Zealand has a long history of defense cooperation with Singapore, as a tiny island nation its armed forces often uses the NZDF’s spacious training and live-fire areas. For the first time ever, the RSAF brought two of their impressive F-15SG fighter-bombers. Though participating in the static display only, they attracted a great amount of attention, and their crews graciously had their ears chewed off by thousands of people over the two days. 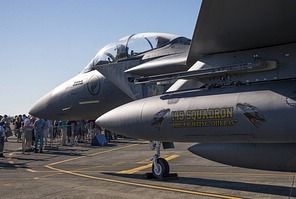 There are discussions taking place at a high level as to whether it is feasible for the RSAF to base a F-15SG squadron here in New Zealand. Not only do they appreciate New Zealand’s excellent training characteristics, both in terms of area, terrain and unpredictable weather, but it also allows them to have more assets ‘off-island’ in case of a debilitating first strike. Joining the Eagles were two out their ten C-130H Hercules. One was available to the public in the static display. The Singaporean Hercules are undergoing a similar upgrade to the Life Extension Program that the RNZAF’s C-130s went through, although theirs will add more KC-130H tanker versions to their fleet in the process. The Japanese Air Self Defense Force committed a KC-767J to the event, which was on static display. The recent engagement from Japan, which included two Kawasaki P-1’s deploying here for the RNZN’s 75th celebrations and helping with surveillance during the Kaikoura earthquake disaster, comes on the heels of new laws in Japan finally allowing them to export defense technology. They are actively trying to sell their Kawasaki P-1 as a replacement for the RNZAF’s Orions, and their Kawasaki C-2 to replace the C-130 Hercules. Japan’s 1st Tactical Airlift Wing 404 squadron has four KC-767J aircraft, which it uses for both air-to-air refueling and strategic transport. They can use both the ‘hose and drogue’ refueling method, as well as the Advanced Aerial Refueling Boom System that is operated from an all-digital Remote Aerial Refueling Operator Station (RARO II) just behind the cockpit. The New Caledonian Armed Forces CN235 is regular visitor to New Zealand, often training alongside the NZDF as they share similar HADR responsibilities, including joining in on the recent Skytrain 2016 exercise. 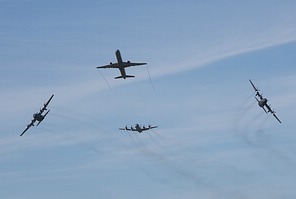 CNE Vincent Frerre and his crew demonstrated their small airlifters capabilities well during their flying display. The CN235 has found success all over the world, with its 6t payload and STOL capabilities in high demand. A larger and modern version of the CN235, the Airbus C295, is a possible contender as a low-tier part of the Hercules replacement. Despite the obvious history between New Zealand and Britain, it is not common for Royal Air Force aircraft to visit. The most common visitors are their C-17 Globemasters, but this year they sent one of their brand new Airbus A400M airlifters, with the inertia for the trip most likely coming from Airbus, who is trying very hard to sell the type to the New Zealand Government as a Hercules replacement (see accompanying article) While this highly capable and impressive machine attracted great attention in the static display, a flying display was sorely missed. The armed forces of Canada and New Zealand have a long history of working together, but usually at a staff or flag level, so their contribution of a CC-130J-30 stretched version of the latest generation Hercules from 436 Transport Squadron was welcome. A possible contender for the RNZAF C-130H replacement, the C-130J-30 is an entirely new aircraft from the previous Hercules, and can carry more payload faster and more efficiently. Whilst it might not offer the biggest capability and performance over its competitors, it does have RNZAF’s history the with Hercules on its side. But since it is such a different aircraft from its ancestor, commonality in support and training is not as great as it would seem. Unfortunately, the CC-130J-30 spent the air show hidden away behind the A400M in the static display. The commentary this year was exceptional with Air Display Commentator Sqn Ldr Kate Bint and Ground Display commentator Sqn Ldr Mike Ward providing an excellent service. Kate is an ex-RAF C-130 pilot, who moved to NZ in 2006, and is now the Executive Officer of the Flying Training Wing. Mike is Ohakea’s Base Executive Officer. It was something of a shame that the speakers were placed in-front of the crowd line facing towards the audience, thousands of spectators trying to photograph the aircraft through the speaker stands. As a sound engineer with decades of international festival experience, this author can tell you that it is entirely within modern ‘health and safety’ standards to put speaker stands within the crowd area, being situated bi-directionally, to leave the flight-line free of obstacles. The airshow’s infrastructure was very good, with enough of a variety of food stalls, ATM machines and toilets available. The traffic management plan worked a charm. A big plus for many was the area for self-contained campervans, where hundreds enjoyed three days of proximity and view. The park and ride worked very well, as did the early opening time of 7am, which allowed everybody to get in well before the days flying started at 10am. The RNZAF’s 2017 Air Tattoo saw the highly anticipated debut of the Airbus A400M in New Zealand. The participating strategic and tactical airlifter came from the Royal Air Force No 70 Squadron, based at Brize Norton, and flew to Ohakea from the UK via Iceland, the USA, Fiji and Auckland’s Whenuapai Airbase. With the retirement of the RNZAF’s venerable C-130 Hercules looming the decision on how they will be replaced is imminent. The arrival of one of the front running contenders in that competition was prescient, and forms part of the European consortiums sales pitch to New Zealand’s MoD. The A400M has been ordered for the defense forces of Malaysia, UK, France, Germany, Belgium, Spain, Turkey, Luxemburg and Indonesia. 38 aircraft have so far been delivered out of a total of 174 ordered. The Germans have reduced their order, meaning 13 aircraft are now available from the current production run, which may offer a chance for the NZDF to ‘jump the queue’ and have aircraft delivered in time to meet the requirement. The aircraft’s maximum payload is 37t, (compared to the current C-130’s max payload of 19t), and a cargo volume of 340m3. The cargo box is 17.71m long excluding the ramp, 4m wide and 3.85m high (4m aft of the wing-box). It’s capable of carrying 116 fully equipped paratroopers, as well as the Royal New Zealand Army’s LAV (Light Armoured Vehicle) and the RNZAF’s NH90 helicopters. The A400M is equipped with eight stretchers as standard, but can accommodate up to 66 stretchers with 25 medical personnel. The A400M can deliver the Army’s 20t LAV to an operating range of 6,300km, or its maximum 37t payload out to 3,300km. The 11t NH90 could be delivered further still, with everything it needs to deploy. 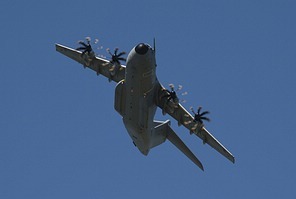 In short the A400M can deliver a much larger payload further than the existing C-130 and to a wider gamut of airfields. 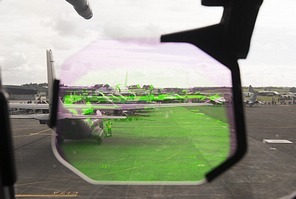 As standard the aircraft is equipped with the Thales EVS (Enhanced Vision System) which projects infrared images directly onto the pilot’s HUD, allowing day-night low-level tactical operations in all weather. The Northrop Grumman AN/APN-241E radar is similar to the one the current RNZAF C-130’s were upgraded with. The aircraft is equipped with a sophisticated DAS (Defensive Aids System) consisting of Thales MIRAS (Multi-Color Infrared Alerting Sensor) missile warning sensor, countermeasures dispensers, with the option of DIRCM (Direct Infrared Counter-Measures) to disable incoming missiles. The modern cockpit and loadmaster systems enable operations with a reduced crew of only three, two pilots and a loadmaster. The A400M comes with an additional capability which the RNZAF does not currently have a requirement for, and that is AAR (Air to Air Refueling). It can be fitted with wing-mounted and centerline ramp-mounted hose and drogue AAR systems from Cobham. The wide speed envelope allows it to refuel fast jets and larger aircraft, as well as helicopters. Upon testing the A400M proved to have difficulty refueling helicopters, since then Cobham re-designed the pods with a longer hose, but this reduced the fuel flow considerably. Although there is no need for the RNZAF to AAR helicopters, the ability of the A400M’s to air-refuel each other, and possibly Future Maritime Patrol and Surveillance aircraft, may well be a game changing capability. Not to mention RNZAF ability to contribute to the AAR needs of its allies. The RNZAF has been seriously analyzing the NZ$230m A400M into how it will meet requirements set out in its recent Defense Capability Plan. Also under consideration is the Embraer KC-390 (25t payload - NZ$116m), Kawasaki C-2 (36t payload - NZ $187m) and Lockheed C-130J (21t payload - NZ $130m). The decision will be a difficult one, as the government must nail down exactly what it wants NZDF to be capable of, while getting the most payload and performance versus value for money. This question goes well past the mere ‘fly-away’ price tag. Fleet size will be carefully thought out to allow the longest airframe life and therefor value for money over time. 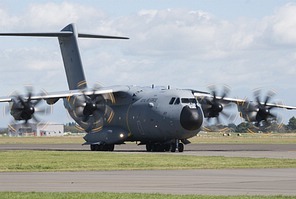 It is highly possible the Ministry of Defence will go for a ‘two-tier’ approach, and back up a smaller number of high end aircraft, such as the A400M, operated alongside smaller aircraft such as the Airbus C295 (9t - $50m). We can be sure that Airbus is offering this package to NZ. There was talk of purchasing two Boeing C-17’s (70t $400m), but with only one aircraft now available that is exceptionally unlikely, and while an extremely capable aircraft it would have been unusable for many of the NZDF’s lower tier requirements, and only two airframes would cause sever logistical and availability shortfalls. The coming replacement of the RNZAF’s P-3K2 Orions, for the Future Maritime Patrol and Surveillance Capability, is also a factor, and some manufacturers are offering sole-source packages to supply both requirements, such as Embraer KC390/E190-E2, and Airbus offering Maritime Patrol versions of its C295. Palletized roll-on-roll-off sensor and command systems are also being offered. This is very much one of those decisions whose benefits must be considered outside the short-term election cycles, so recent governments have delayed the decision until the next election cycle. With the RNZAF’s fleet of post Life Extension Program C-130Hs due to retire early in the 2020s, the decision will certainly have to be made by the next government. Among the plethora of factors that will be involved in this decision, two big ones for the RNZAF is their rapid HADR (Humanitarian Aid and Disaster Relief) commitments, and their operations in and out of Antarctica. The A400M has a lot going for it in both of these areas of concern. Since it can transport the NH90 helicopter directly into theatre, the often flattened and devastated islands further out in the South Pacific would not need to wait for the NH90 to arrive aboard the HMNZS Canterbury. Also the A400M’s ability to transport a reduced load (but still more than the C-130) all the way to the Antarctic, and then return to Christchurch if the weather closes in, is a big bonus. The B757 and C-130 pass a ‘point of no return’ enroute to the Antarctic, still hours away, where they must make a go-head or abort decision given current weather. Given the recent ‘below minima’ emergency landing the B757 had to do in Antarctica, the NZDF is re-evaluating how it will operate from the Ice, and this could be a big tick in favor of the A400M, depending on the importance the Ministry of Defense places on this capability. According to Airbus, the A400M’s performance and payload means that a fleet of 8 A400Ms has the same productivity (measured in ton per distance per year) as a fleet of 18 current generation Hercules, while offering a 40% lower flight cost per hour per ton airlifted. Whether this ratio of cost-savings would translate to the much smaller fleet that New Zealand could afford would no doubt be under consideration. Despite the A400M’s modern technology and high performance, it may well be the little things that will make the biggest difference to the ‘end-user’ ie: the paratroopers and service men and women who will be putting in the long hours in the cargo hold… The aircraft comes with not one, but TWO fully functional latrines, padded crash-worthy seats and has so little vibration and noise inside its pressurized fuselage that the experience is comparable to that of an airliner. For anybody that has done an eight-hour haul in the C-130’s webbed seats and been forced to use the ‘piss-pot’ down by the ramp, this could well be the most noticeable improvement. This airshow report and accompanying A400M article has been made possible by KiwiFlyer magazine.